He’s talking about Brown Pelicans. Monte has been part of oil-spill rescue teams all over the country. 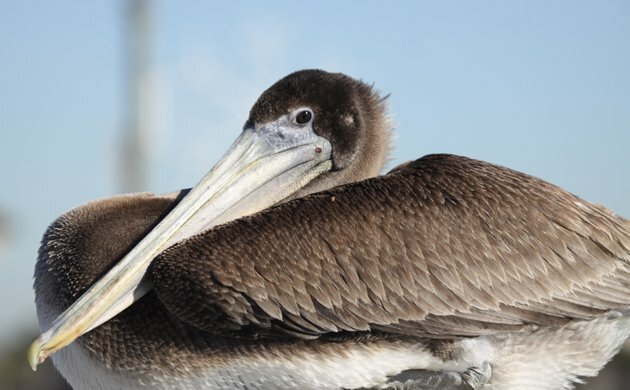 He told me about last summer, when Bird Ally X received 246 Brown Pelicans covered not with petroleum, but with fish oil. The result is the same: feathers are coated, waterproofing is lost, and the birds die from hypothermia and starvation. Fisherman along California’s Redwood Coast are supposed to use fish-cleaning stations, where they clean their catch on large tables and place the rest in large containers. Both the US Environmental Protection Agency and California state law define fish remains as sewage, and it must be disposed of properly. Naturally, this is not always the case. Last summer in one marina the fish remains were going into a grinder the size of a VW bus. But instead of being carted away, the oily mess was simply funneled into a large pipe, and then spewed out into the ocean. Pelicans, waiting for a free meal, stood under the pipe and were seriously slimed. It takes about an hour for a team of three people to painstakingly wash each bird with Dawn dishwashing liquid (a rehabber’s best friend), rinse and dry them. Birds who have been oiled for days or have infections require additional care. They eat like hogs, with 250 pelicans eating hundreds of pounds of smelt a day. Like all rehabbers, Bird Ally X volunteers spend a lot of time asking people for donations. “The trick with rehabbing any oiled aquatic bird,” says Monte, “is to make sure they feel comfortable enough to preen. 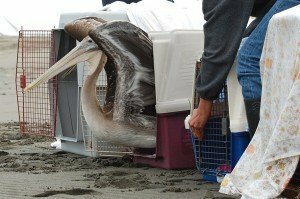 We can get the contaminant off their feathers, but from then on they have to do the work.” As a pelican concierge, Monte has come up with tricks such as drilling holes in the sides of plywood hospital boxes and substituting pallets for flooring, all to provide ventilation to compromised birds who might otherwise become overheated. 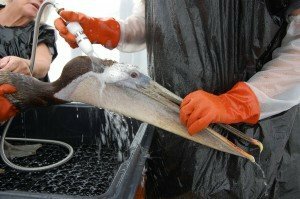 Besides actually rehabbing, Monte spends a lot of time convincing people that fish waste could be a money-maker and save birds’ lives in the process. Remembering a fourth-grade class where he learned that Massachusetts Native Americans planted fish heads along with their corn, he collected fish waste and composted it. A few months later he put an ad in the local paper describing the resulting soil, and within a few hours every garden club member in town had arrived and the entire 3 ½ yards of compost was gone. Where Are You Birding This First Weekend of September 2010?